It’s been a wretched 48 hours for the Brighton and Hove Green Party. Cllr Ben Duncan’s tweet about Armed Forces day, and the ramifications of that, has dominated debate – but there is other news that may demonstrate that the Green Party in this city is in a state of collapse. At the time of writing Duncan remains a Councillor, and the Green Party continues to tear itself apart over the issue. Caroline Lucas has – doubtless against her will – been dragged into the affair, initially arguing that Duncan must apologise but with her position subtly changing during yesterday: she initially suggested that Duncan should be disciplined if he did not apologise but was tweeting later in the day that Duncan should face disciplinary proceedings regardless. That itself reflects public mood – the mood in the city is quite clearly that apology is not enough (although the Tories – presumably reluctant to face a by-election in Queens Park that they’d lose and whose most likely outcome would be to boost Labour’s campaign to win back the Kemptown constituency – have been strangely quiet). 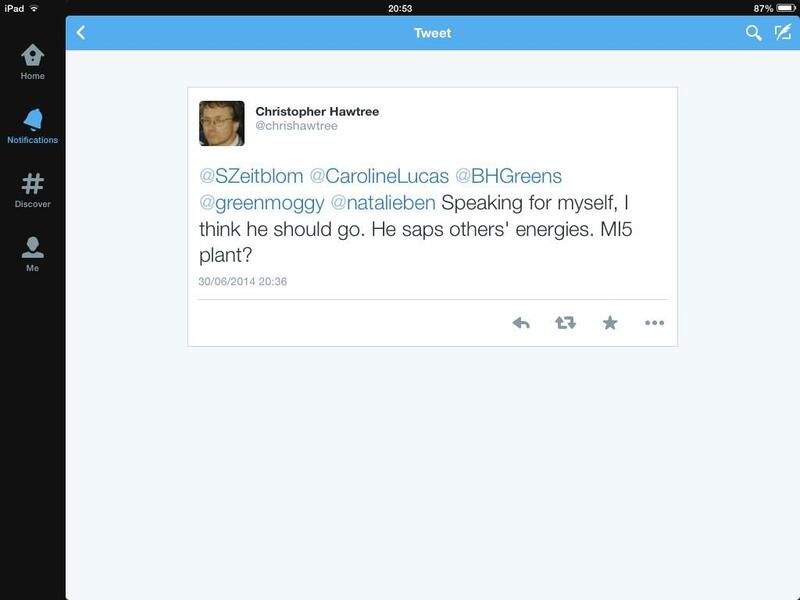 And in a remarkable exchange, the Green PPC for Hove, Christopher Hawtree, not only called for Duncan’s resignation but even speculated – in tweet that was hastily re-written – that Duncan might be an MI5 plant. Hawtree’s whimsical humour takes politics to strange and uncharted places, but it is difficult to imagine any other party in which a Parliamentary candidate would make that kind of comment about a sitting Councillor of the same party in the same city in a public forum. It is eloquent of a party that seems to have given up politics to focus on fighting each other. But another story about the Green Party in Brighton, though less prominent, is every bit as explosive. Labour group leader Warren Morgan tweeted last night that he had been made aware that the Green Party selection of council candidates had failed to find sufficient candidates to fight many more than half the seats up for election next year. It’s a stunning admission but not a surprising one. The Green Group has found office traumatic; many sitting councillors appear to have simply given up. One councillor of course has had long-term leave due to illness and nobody would want to criticise her for that. But other councillors’ attendance records have in many cases long been poor and some appear to have disappeared altogether. It was a commonplace that in 2011 the Greens effectively elected a large chunk of their activist base to the council; and appears simply not to have renewed that base. As a party it looks increasingly focussed on taking forward a dialogue with itself, not undertaking politics at all. And it is difficult not to speculate that the two issues – disciplining Duncan and finding candidates – in their different ways illustrate a big issue for the Brighton and Hove Green Party – what might be termed their woman problem. Brighton Greens recently announced their intention to require at least one woman candidate in two-member wards and two women in three-member wards; but the Green Party in Brighton has a reputation as deeply hostile environment for women. It is a matter of public knowledge that there have been accusations of bullying of women within the Green Group, and that this was one of the reasons for the calling-in of counsellors and mediators a year ago. When an individual who has been in and out of the Green Party but is very much part of the Brighton and Hove Green family conducted a misogynistic campaign of stalking and bullying against Labour’s Emma Daniel during the Hanover and Elm Grove by-election a year ago, hardly a voice was raised in protest. Many have compared the relative licence given to Cllr Duncan with the swiftness with which action was taken to expel Cllr Christina Summers from the Green Group, regardless of the merit of that decision. Whether fair or not, plenty of people are willing to speculate that the Green Party’s response is very different when one of the boys puts his foot over the line. The tyranny of structurelessness at the heart of the Green political method means that in this party of the privileged, there is no mechanism for readjusting the balance of privilege; and when I look at the behaviour of the Green Party in Brighton and Hove, it is perhaps my distant memories of being a prefect in a minor boys’ public school that provide the most pertinent insights. Green politics in Brighton increasingly looks like a boys’ game, conducted according to arcane and semi-secret rules and with half an eye on keeping Matron away from the clubhouse. No wonder, for all the fine words, they find it hard to attract candidates of either gender. But whatever the causes, if it is true that the Greens are struggling to find even half the candidates they need to fight a full election campaign next year, it’s another sign that the endgame is under way. The Green Party in Brighton and Hove has become so toxic a brand that even the Party’s former leader and only current MP, Caroline Lucas, doesn’t refer to it on her literature. Its politics have become little more than grandstanding and posturing individualism; organisationally it is hollowed-out, its spin looks increasingly desperate, and Caroline Lucas’ re-election campaign will rely on money and helpers from outside the city. Caroline Lucas may survive as effectively an independent MP, but with ties to a party that has in any meaningful sense ceased to function in the city. The Green dream is over. This entry was posted in Brighton and Hove, Green and tagged Ben Duncan, Brighton and Hove Green Party, Caroline Lucas, Christina Summers, Christopher Hawtree, Emma Daniel. Bookmark the permalink. Difficult to disagree with facts or logic presented. Leaves me with less choice on who to vote for in 2015 hence rather depressing. Labour are not radical enough they just tinker. Does the country need a radical agenda. One could argue that the UK is a mature democracy / society needing only a few adjustments here and there. I would emphatically disagree with that. The future shape of the UK is not difficult to see; a privately educated elite sitting atop a low wage economy with low paid workers bussed into city centres to provide services the rich can’t do without – already happening in parts of London. Tinkering will not fix that. So what to do. Blair understood elections; win the centre. Unfortunately the ‘centre’ don’t do radical. In 1997 Labour won a massive majority and tinkered. The Tories are cleverer. No mention of dismantling / privatising NHS – too radical. But they are doing it. Key to a better future for the UK is an education system of quality available to all rather than a poor state system for the masses and a private system to generate an elite. In 1997 Labour could have used their massive majority to abolish private education. Abolition of private education is counter-intuitive; the best schools, offering the best outcome to pupils and no longer dominated by ‘toffs’. Good for the child but bad for the nation; hollows out the state system re-ushering in an era where the school you went to matters more than of ability. Fortunately my other country is Germany with an excellent state system that predicates economic success and a more equal society. (A bit like the car sticker on an old Lada; “My others cars a Porsche”).